City-chic styling you can walk in for miles! 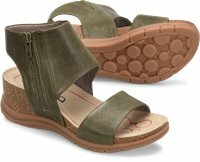 The Palotina's super-soft perforated leathers hug the foot with just the right coverage, and the functional zipper adds a stylish edge. I like the look of this shoe and they are very comfortable with the perfect heel height for me. They are a little big on my foot and looser than I would like but I must have skinny ankles because this is a frequent problem. I got them at a good discount and don't know that I would pay full price for them. It's a little steep. I have a several pair of bionic a shoes. All of them are super supportive and have worn great. I like the look of this style but it is very uncomfortable on the outside of my feet. Over all after working in then one day I was not super pleased with the comfort level. Also After wearing them only twice the stitching came apart on the strap above my tattoos and has slid out from under the top piece. These are cute sandals but I think I liked them better in the photo online than in person. They are comfortable enough, but they fit a fit funny along the outside. That does resolve itself with wear, but initially it's a bit bothersome. I would not wear these on an extended vacation trip with lots of walking. I don't think they would be comfortable enough. I do like the light metallic leather. They are cute and go with everything from denim jeans to white pants. I like the styling very much. The side zipper is stylish, as well as functional. Work on the fit around the foot and they would be true winners. These are stylish, supportive and comfy all at once (-: this is my first pair of shoes from Bionica. They're a little loose around my ankle but nothing very noticeable, I do have skinny ankles however. They did a nice job with these, no foot pain what so ever.